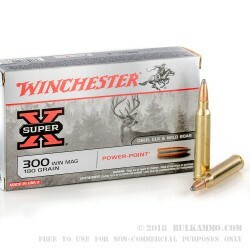 Winchester’s .300 Magnum 180-grain Super-X cartridge is designed for use in hunting a wide variety of game. It can fell almost any prey with ease, thanks to its exposed soft-nose design. The high weight and velocity of this round makes it effective against big and small game alike, while its soft core allows it to dump more of its terminal energy on impact. The copper jacket on this 300 win mag ammo will keep the expansion of the round uniform as it hits, forming larger impact cavities on your prey. Finally, its copper jacket design gives it superior accuracy at range, promoting your chances of scoring an accurate hit on your first shot! All these features are brought together in a single, sleek, do-it-all package conceived by the ammo experts at Winchester. 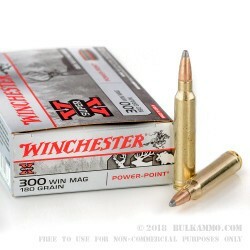 The Winchester .300 Mag Super-X bullet travels at 2,960 feet per second out of the muzzle, producing 3,502 foot-pounds of energy. 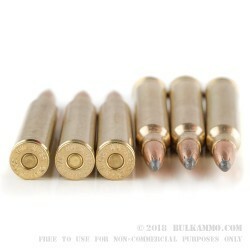 The bullets loaded are 180-grain soft-nose rounds. 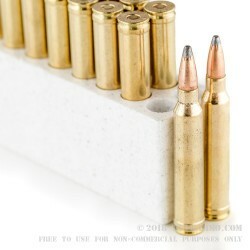 The boxer-primed brass casings are safe to reload.